This hand curated experience combines organic locally sourced food, responsibly grown cannabis, and music. Upon arrival guests will be greeted with a welcome cocktail hour including 2-3mg appetizers and CBD mimosas, followed by a 4-course non-medicated menu prepared by the amazing and decorated Food Artist Uneeda of DC’s Sweet Sensations. Between courses, we will be sampling a selection of both flower and oil sourced from our very own family farm, as well as from the farms of our most trusted cultivation partners. 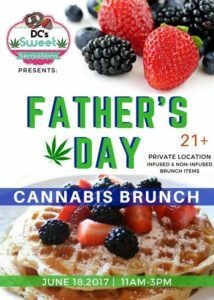 While your ticket includes a 4-course meal, happy hour, paired cannabis sampling, and a DC’s Sweet Sensations gift bag (worth $125 retail), you’re not the only one who benefits from this experience. At Bloom Farms we donate a meal to a food insecure individual or family for every product sold. 100% of any profits will be donated to the Bread for the City Food Bank to provide healthy meals to families in need. This is an amazing opportunity to share ideas and laughs with friends old and new. We hope you can join us for an afternoon of relief, relaxation, creativity, and fun!